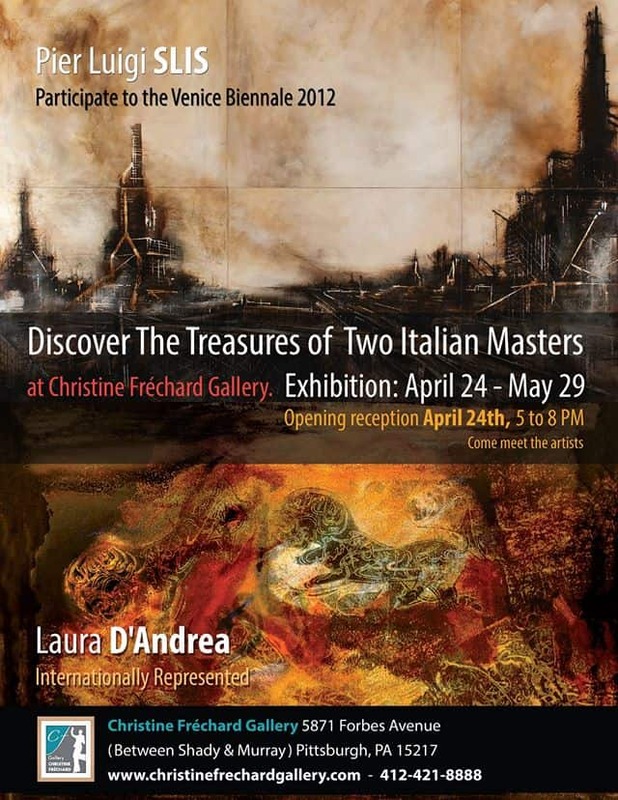 The Christine Fréchard Gallery will host an Opening Reception of Two Great Italian Masters this Friday, April 24. Come and meet the artists, Pier Luigi Slis and Laura D’Andrea, at the Gallery located at 5871 Forbes Avenue (between Shady & Murray). Pier Luigi Slis is an amazing talented artist living in a small village in Northern Italy. In 2012, he participated in the Venice Biennale. He is a brilliant artist and completed devoted to his passion: painting. Born in Sicily, Laura D’Andrea Petrantoni lives and works in Sicily and Rome. She studied at the Academy of Fine Arts of Rome and Urbino, printing and xylography, and literature and philosophy at the university of Grenoble. In 1980, she studied Arabic calligraphy in Cairo, and executed a series of xylography, then presented at the Education Ministry and the Egypt Academy in Rome. Call 412-421-8888 for details or visit the gallery’s website.